These are beautiful, Maud. I love all of your mittens! Glad to see the computer finally decided to cooperate. They are so beautifull! I almost couldn't wait until the description was ready. And now I cannot open the chart! I'll have to wait until someone with al lot of computerknowledge comes by. Maud, your mittens are beautiful!! Thank you so much for your time in sharing this pattern with us all. I wish I did not have so many projects going right now, I would love to make these!! Maud, You are so very talented. Thank you for sharing this pattern. 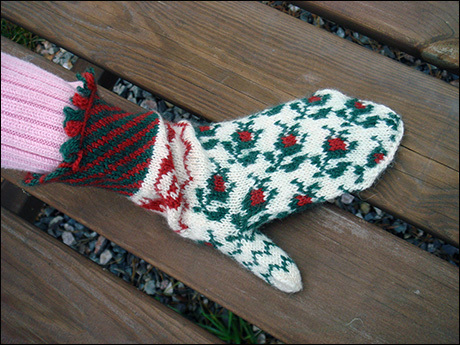 I've always wanted to learn how to knit a mitten, and your pattern instructions sound so easy. This will be my first! 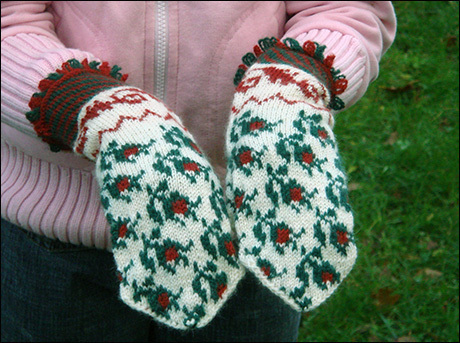 Thanks so much for sharing your pattern, and for sharing tips on stranding too. I love coming to your blog and seeing what you've been up to. What a gorgeous pattern, thank you for sharing it with us. Oh wow! Thank you for sharing! Maud, They are absolutely beautiful!!! And the two color fringe is absolutely great on them. Thanks for sharing the pattern, too. Don't let the new puppy get near them. 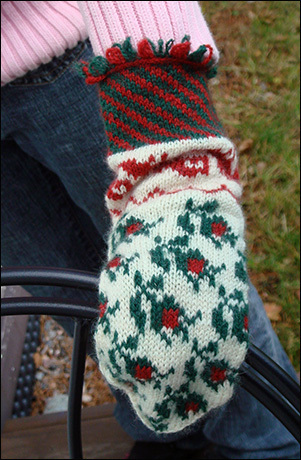 Your one smart cookie Maud, wonderful mitten and pattern. Maud, the mittens you designed and knit are BEAUTIFUL. Thank you for being so generous with your design! Thank you so much for publishing this pattern. I can't wait to make some. They're lovely. they're gorgeous! what a generous pattern to give out to all of us. thank you for sharing! Oh....Thank you, thank you , thank you! They're so lovely and I can wait to buy some yarn to make these for my little girl. 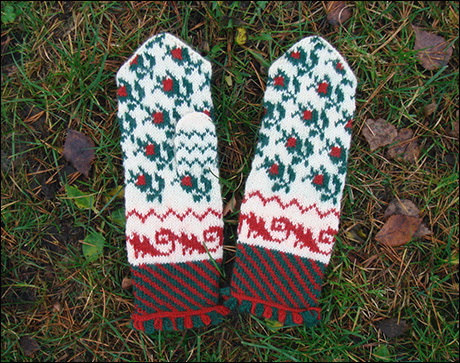 They are beautiful and an inner mitten would make them perfect for those days when winter really hits us and the mercury drops to -40 and below. Nydelige votter. Takk for at du deler mønsteret med oss. you are such a talented knitter! What beauties these are! Happy New Year and i'm looking forward to another year of reading your blog and envying your knitting abilities!